Take a clean jar and add vodka into it. Take a vanilla pod and slit vertically. Open the pod and observe vanilla beans inside. Scrape the beans from pods using the back of a spoon. Add these beans into the vodka in the jar. There would be aroma in the pods also---so cut the pods into small pieces and add them to the vodka in the jar. Similarly separate beans and chop pods of remaining vanilla pods and add to the vodka in the jar. See that all the beans and chopped pods are fully immersed in vodka. Close the jar with an airtight lid and place it in a darker place like a shelf. Once in a while shake the bottle. After few weeks observe that flavor and color of the vanilla beans gets transferred to the vodka. Keep this jar aside without using the essence. Use this freshly made vanilla essence in making cakes, cookies and desserts and also in ice creams and whipping cream.Remember to cover the jar with an airtight lid to retain aroma and also remember to keep this jar in a dark place like a shelf. After 6 months one can use the essence. 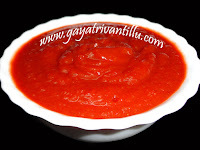 As per requirement take sufficient quantity of essence and use it. No need to strain the mixture---let the pods and beans remain in the essence. If any particles appear in the essence---do not worry they are just the beans or particles from the pods which also have flavor and hence can be used comfortably when using in baking cakes or cookies---but when using this essence in ice cream strain it to remove particles. When taking essence from the jar replace the quantity of essence taken from the jar with the equal quantity of vodka. There would be lot of flavor in the pods and beans and hence they need not be removed from the essence after six months. So take required quantity of essence and replace it with equal quantity of vodka and let the processing continue. To have fresh vanilla essence at home do not remove beans and pods from the essence jar---just replace the quantity used with vodka. However check after 12 or 18 months and if required strain and remove old beans and add fresh beans and pods. While replacing the vanilla pods no need to add 10 vanilla pods the next time---just add 2 or 3 vanilla pods as the vodka is already transformed into vanilla essence. The additional pods are required to be added because we are replacing the quantity of essence with vodka when using the essence. So take few pods from the essence and check by smelling to know whether flavor still exists in those pods---if it exists continue using essence & replacing with vodka and if flavor does not exist remove pods and add fresh pods. No special effort is to be made to make vanilla essence at home. Infusing vanilla beans and pods in vodka transforms vodka into an aromatic vanilla essence. Quantity of vodka is not mentioned as it does not matter. See that the pods and beans are fully immersed in vodka---add that much vodka. Till there is flavor in the pods and beans replace vodka with the quantity of essence taken from the jar and the process continues. 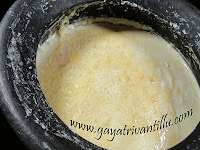 With few vanilla pods one can make and use vanilla essence for few years and it is very easy also to make it at home. Do try to make this pure vanilla essence at home for making desserts or cakes or cookies.